Pocahontas is a 1995 American animated epic musical romantic-drama film produced by Walt Disney Feature Animation and released by Walt Disney Pictures. The 33rd film in the Walt Disney Animated Classics series, the film is part of the era known as the Disney Renaissance which lasted from 1989 to 1999. Directed by Mike Gabriel and Eric Goldberg, the film is inspired by the known history and folklore surrounding the Native American woman Pocahontas, and portrays a fictionalized account of her historical encounter with Englishman John Smith and the Jamestown settlers that arrived from the Virginia Company. The voice cast features Irene Bedard, Mel Gibson, David Ogden Stiers, Russell Means, Christian Bale, Billy Connolly, and Linda Hunt. 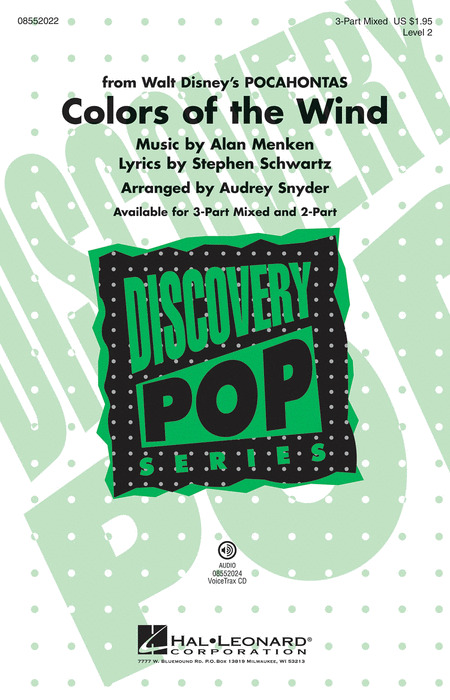 The musical score was written by Alan Menken, with songs written by Menken and lyricist Stephen Schwartz. Pocahontas was released on June 23, 1995 to a mixed reaction from critics, who praised the film for its animation and music, but criticized the film's story and historical inaccuracy. Nevertheless, the film was a commercial success, grossing $346 million at the worldwide box office. 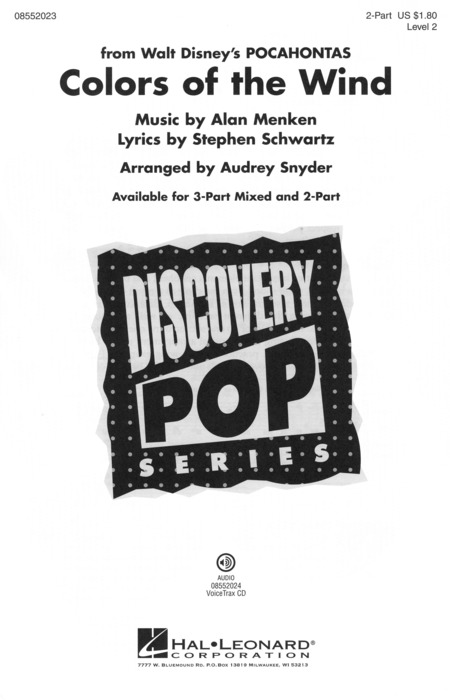 Pocahontas received two Academy Awards for its achievement in music: Best Original Score for Menken's score and Best Original Song for "Colors of the Wind". A video game based on the film was released across various platforms shortly after the film's theatrical release, and the film itself was followed by a direct-to-video sequel entitled Pocahontas II: Journey to a New World in 1998. This treasured tale from America's past comes alive in this medley from the Disney animated feature. Available: SAB, 2-Part, ShowTrax CD. Performance Time: Approx. 8:00. From the Disney animated film Pocahontas, this beautiful balled, which speaks of respecting nature and living in harmony with the Earth's creatures, is now arranged in a contemporary, pop a cappella style. The 12/8 meter gives it a soulful, gospel style. A big forte makes this a centerpiece of your concert and the delicate ending shows off your singers' range of dynamics and emotions.